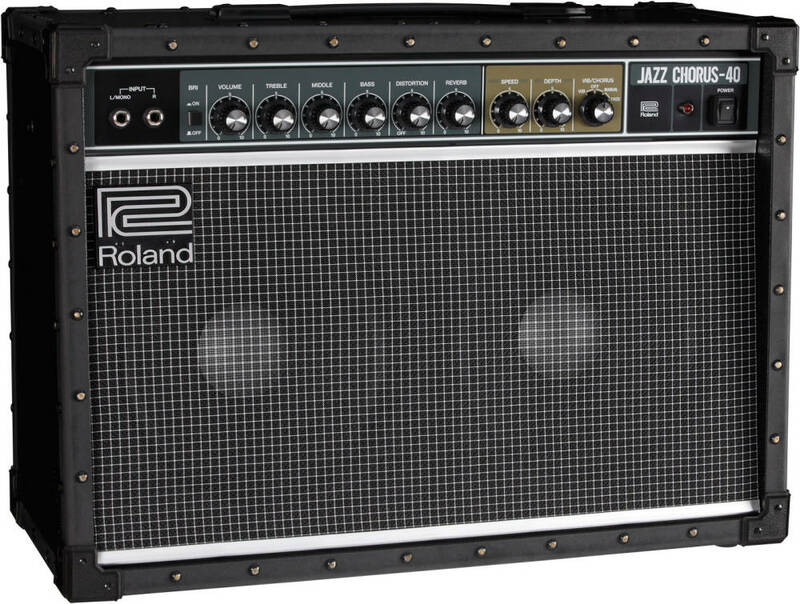 You can now pre-order the Roland JC-40 for mid-October delivery! 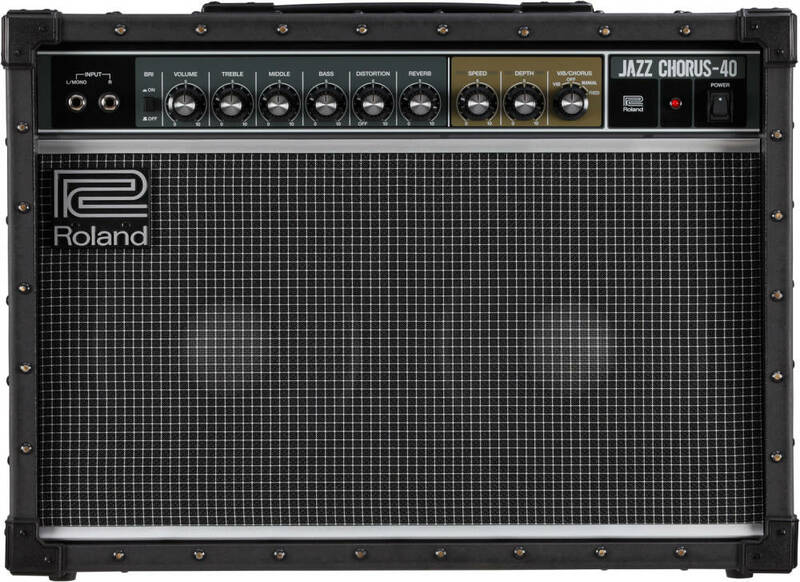 The JC-40 Jazz Chorus delivers Roland's renowned "JC clean" tone and signature stereo chorus effect in a compact combo amp with evolved features for the modern guitarist. Like the flagship JC-120 amp that it's based on, the JC-40 offers a classic stereo clean sound that's a perfect palette for tone shaping with stompbox effects. Now, there's also a true stereo input for enhanced performance with stereo effects pedals, guitar synths, amp modeling gear, and multi-effects. In addition, the JC-40's onboard effects include newly added features and updated sounds to support the needs of today's players. Great amp to channel your inner 80's. Stereo input is great for feeding your digital delay or reverb straight into the front of the amp. Sound of the chorus is really next level. You have to hear it to believe it. Nice size for carting around. Not to heavy, but big enough it sounds like a full amp. Amp Distortion is quite usable too, sounds very much like a blues driver pedal to me. I had a Roland JC-120 in the 90's and it was great, but hefty and loud - it also had an annoying hiss. Well guess what, we're in 2018 and Roland has not decided to release an updated and smaller version, great right? well they decided not to address the annoying hiss which is clearly present in the JC-40. The hiss is instant as soon as you turn on the amp - this with nothing plugged into its inputs. The hiss will get worse if you increase the volume or even worse if you use the Bright function. Yes it is true that it's "white noise" so less obstructive when you're playing but it's annoying if you're a subtle player and/or doing studio recording. I also run a Roland Cube 80 XL, which has zero hiss. I tried two different brand new units, both were the same - at the store, at home and in the studio. So be aware of this, reflected in my overall 4 star rating. I love everything else about this amp, mostly the sound texture and the stellar response. But at this high price point and in today's tech age, amp hiss? An expensive compromise. As many have said, the amp has an excellent "clean" sound. I can play it very quietly in one room but when you turn it up at all it will start to buzz. This is not noticeable when you are standing with it cranked a bit. I bought the amp because it does double duty as a stereo keyboard amp. Overall, a gorgeous amp to play because it is so accurate and flexible: keyboard, archtop, electric, pedals: they all sound great! 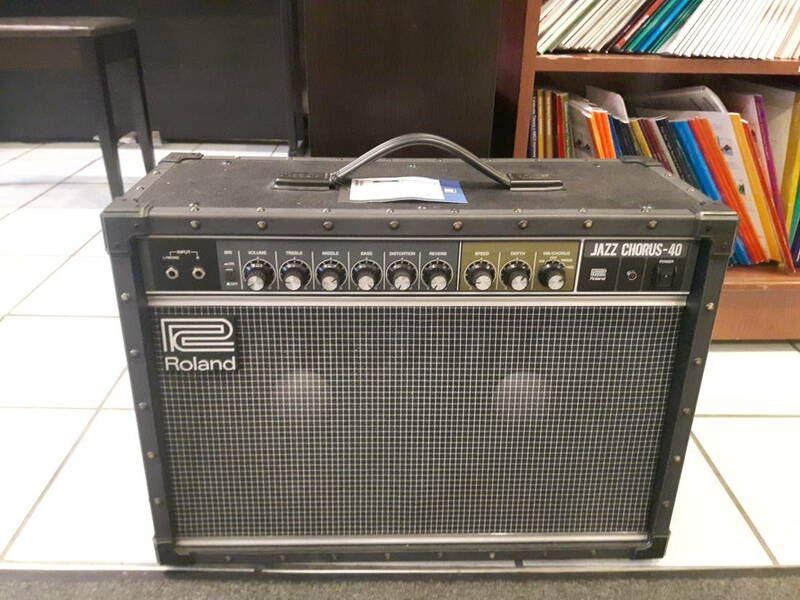 I was always a Fender blackface fan for clean but the Roland attracted me for 80s tones. As opposed to Fender, the Roland clean is even cleaner however I found the bright switch to be too bright and not like Fender at all. The amp really shines when the vibrato or chorus is used with reverb.Despite its compact size, this amp is loud. The smaller speakers do have a slight honkiness to them though which was hard to tame. There was a lack of bass. I found I had to crank the bass and almost turn the mid control off. The distortion channel had a slight volume drop as well once it was turned on. Don't expect a high gain monster here either. Over the years most never used the distortion in the JC 120 but I found it useable in the 40 with an overdrive. Its no frills but it works. Just think The Cult, Flock of Seagulls, The Police and you get the idea. I tried the JC40 down in Victoria on a Godin Multiac. Damn. It sounded good. It took a month or two before I purchased one for my home recording space. I own a Roland KC880, too. I LOVE this amp on my Multiac recording guitars. It needs EQ attention on my telecaster or Gibson......but I will never regret adding this to the arsenal. The fortieth anniversary version of the JC120, this model offers more features in a lighter package and at a better price. With headroom through the stratosphere and a lush, true stereo chorus that will take your breath away this could easily become your 'go to' amp. If you want a dirty crunch or any effect, this is the amp to plug your favourite pedal or effect into without colouring them. This is a true, very loud forty (2x20) watts! 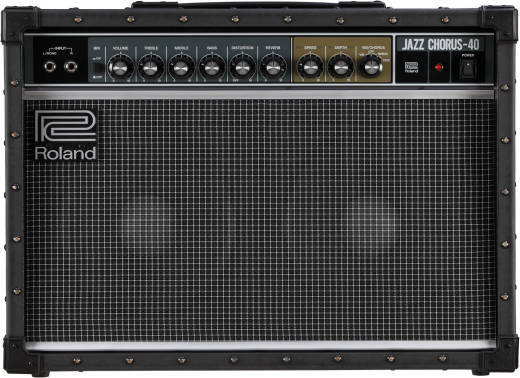 Many famous bands recognized the qualities of the JC120 (The Police,The Beach Boys, Aerosmith, Pat Metheny etc.). This has it in spades. A real gem! I love the amp. I never thought that I would like a solid state amp this much but I have never heard a clean sound like this. It takes to pedals really well. Weighs hardly anything. Cuts through very well, yet still has plenty of bottom end. I can feel the floor shake as I crank it up. This amp is packed with features, Stereo effects loop, Stereo 1/4 line outs, Stereo Inputs for stereo effects, updated distortion circuit, pure roland chorus/vibrato onboard effects and more! I can't get enough of this amp, been using it at band rehearsal with mono and stereo effects rigs and sound sits right in the mix with the rest of the band. I use the onboard chorus effect because whats better than the lush stereo 3D roland chorus effect! 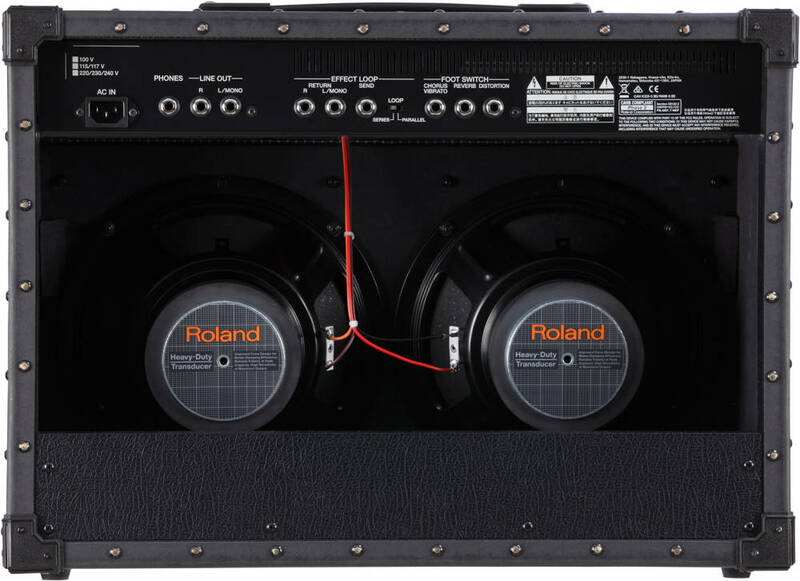 Made out of good materials, knobs are of Roland JC quality, 2x10" Roland speakers, and dead quiet operation. Getting much more usage then my tube amps!